Stay in one of their spacious Townhomes and get great discounts on skiing! Get more information on our Accommodations Page. For more information and reservations, visit our accommodations page. So, what are you waiting for? Come on up and Ski the Wolf! 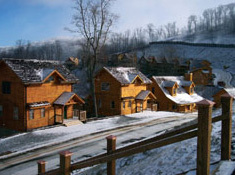 Wolf Ridge Ski Resort is a family-oriented resort. Wolf Ridge was formerly known as Wolf Laurel Ski Area. …And it doesn’t appear that “The Wolf” is going to stand pat with these upgrades! 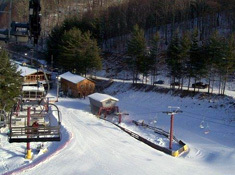 They have recently expanded, and now offer 15 ADDITIONAL acres of ski slopes and trails! As if that weren’t enough, they have also added a new quad lift, a new terrain park and much more! 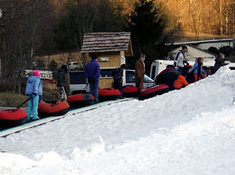 Wolf Ridge Ski Resort is North Carolina’s most accessible ski slope. You won’t find miles and miles of two lane roads and harrowing curves—the resort is located just 5 miles from I-26 (exit 3) and just 30 minutes from Asheville, North Carolina. The resort offers great terrain for beginners to advanced skiers and snowboarders, and those who enjoy Mars Hill Snow Tubing. There are rental cabins in and around the Mars Hill Ski Resort. In addition, there are several hotels that offer discounts for skiers. Scenic Wolf Resort is conveniently located near the top of Wolf Ridge. All cabins are located close to the ski slopes and the Upper Lodge—home of The Lodge Steak & Rib Restaurant. These beautifully designed rustic log homes include picturesque mountain views from wraparound decks, full kitchens, large living spaces with fireplaces and three or four bedrooms. Swim in the sky-high, glass-enclosed, heated pool year-round. They have added 8 new furnished townhomes that will sleep up to 16 people overlooking the Breakaway ski slope. These units are great for groups and large family gatherings! For more information or to make a reservation, please contact Scenic Wolf Resort at 877-828-9653 orwww.scenicwolfresort.com.